Cospheric announces new particle size ranges for its BKPMS, Paramagnetic Microsphere product. 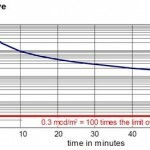 Thanks to customer demand for narrower particle size ranges of paramagnetic microspheres. These highly opaque microspheres are homogeneous PE and often used in microscopy for high contrast cross sections. These sizes are in addition to its extensive range of black magnetic microspheres available up to 1.0mm (1000 micron) in diameter. 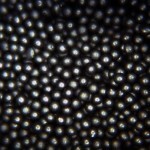 Phosphorescent microspheres in particle sizes 10 to 600 microns are now available from Cospheric LLC. 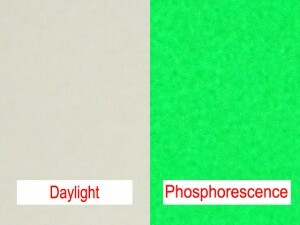 These phosphorescent particles are 90% spherical and appear to be off-white under ordinary daylight or regular room illumination. However, when the lights are turned off these phosphorescent particles exhibit phosphorescent yellow-green after-glow. The spheres have tight particle size distributions and are > 90% within size range. Polymer spheres that incorporate proprietary phosphorescent ingredient have a melting point of 115°C , and are mechanically stable past 90°C. 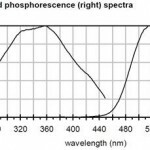 Phosphorescent beads are also inert in most solvents. Fluorescent microspheres are round spherical particles that emit bright colors when illuminated by UV light. Ability to emit intense color under UV (black light) illumination provides contrast and visibility of microspheres relative to background materials. In addition to the benefits of conventional high quality microspheres, such as sphericity, smoothness and spreadability among others, fluorescent spheres offer extra sensitivity and detectability for analytical methods. For example, fluorescent microbeads are often used as traces to simulate spread of viruses in medical research. 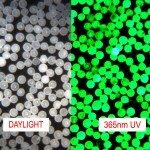 Typical applications of fluorescent spheres include: testing of filtration media and systems, vial and container cleaning studies, flow tracing, flow visualization, and fluid mechanics studies, medical imaging and flow cytometry, fluorescence microscopy and photography, as well as biomedical technology research, qualification and validation of medical devices, biomedical diagnostics, process troubleshooting and process flow among others. Specifically fluorescent microspheres are often used for water- and air-flow testing and bead-based diagnostic applications. New unique applications of fluorescent spheres are being discovered daily.